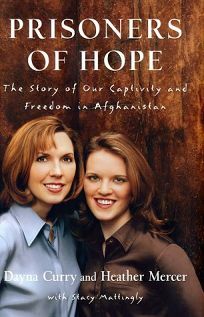 This is the eagerly anticipated story of the two Christian aid workers from Waco, Tex., who were imprisoned by the Taliban in Afghanistan shortly before the September 11 attacks on America. Because so many Americans followed their plight in the press, the behind-the-scenes details of their 105-day ordeal will inevitably be riveting. Unfortunately, the narrative is told in a weaving fashion that shuttles back and forth between Curry's voice, Mercer's voice and their joint perspective. Moreover, much of their story of monotonous prison life does not lend itself well to straightforward chronological narrative. Instead, the book is organized loosely by themes, places and people, and often leaps ahead of itself in confusing ways. Despite these frustrations and a surprisingly weak fade-to-black ending that barely mentions God or the faith that has sustained the missionaries throughout, the book is compelling. Readers will learn of the individual paths that led Curry and Mercer first to Christ and then to Kabul. Especially heartbreaking are the stories of all the Afghan families who were relying on the women for life-saving support and who were abruptly cut off at the time of their arrest. Perhaps most powerful is the honesty with which Mercer discusses her spiritual difficulties in captivity. This is not the story of larger-than-life heroines whose faith never wavers in the face of persecution; readers are allowed glimpses into Mercer's very real despair and the rift it caused in the group of prisoners. This gritty sense of the real life of ordinary, believing Americans keeps the pages turning. (June)Forecast:Curry and Mercer have become media-appointed American paladins, so this should garner some strong attention in both the Christian and secular markets. It is a main selection of the Crossings Book Club and a featured selection of the Literary Guild and Doubleday Book Clubs.